Orange and maroon ribbons on the antenna of a state police motorcycle. Photo taken April 21. Police cruisers on the Drill Field circle. 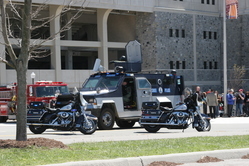 Security truck and state police outside of Lane Stadium. President Bush returns to Marine One after his visit to Virginia Tech. 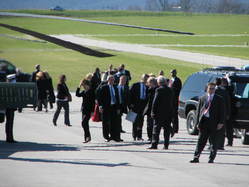 He is surrounded by Secret Service agents. 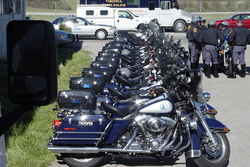 The Virginia State Police awaits the arrival of President Bush at the Blacksburg airport. These officers will be apart of the presidential motorcade. 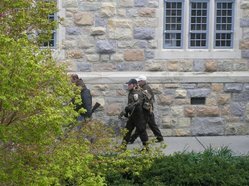 Two individual look upon Norris Hall where the shootings occurred. 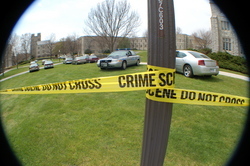 The crime scene near Norris Hall is filled with a police presence. 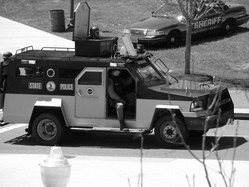 Police presence is to be found everywhere on campus. 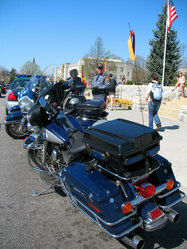 Several officers tie the Hokie ribbon on their motorcycles. Several police officers (both local and state) are visible and present during the convocation. 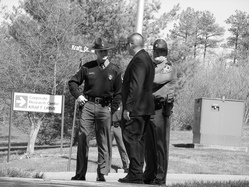 Police presence surrounds the campus for both security purposes and the visit of President Bush.